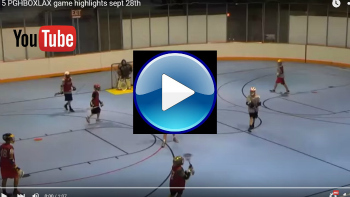 The new and improved PGHBOXLAX lacrosse leagues are going strong at the Iceoplex at Southpointe! Session #2 will be played on a TURF surface (turf shoes or sneakers, not field cleats, are recommended). Our improvements of adding a shot clock, using “real refs” (ALOA/PIAA-certified) and having an EMT on-site for all games have been well-received by all players and families. U11 box league – U11 box league will be played on six consecutive Tuesdays from 6pm-7pm beginning Nov 10th and ending December 15th. Fee per U11 player is $175 for the six week season. U13 and U15* box leagues – U13 box league games will be played on six consecutive Mondays at 6pm-7pm (and/or 7pm-8pm) beginning November 9thand ending December 14th. U15 box games will also be played on Mondays at 7pm and/or 8pm (and potentially 9pm). Fee for U13 and U15 players is $185 for the six week season. HS* box leagues – HS box league games will be played on six consecutive Wednesdays beginning November 11th from 6pm-9pm (and potentially 9-10pm). Fee for HS players is $185 for the six week season. *-Age-eligible HS freshmen may play in the U15 (6 Mondays) and/or HS box leagues (6 Wednesdays). To be eligible for U15, HS freshmen must be born on or after 9/1/2000. A $25 discount will be given for HS freshmen players registering to play in both U15 and HS leagues. Mens’ box league – our mens’ adult league will be played on six consecutive Tuesday nights beginning Nov 10th and ending Dec 15th from 8- 9pm (and potentially also 9-10pm). Fee/player is $185 for the six week season. 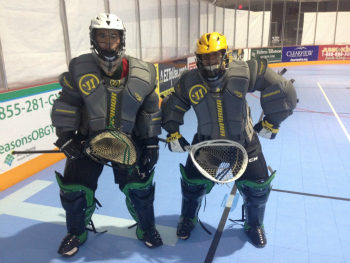 GOALIES NOW PLAY FREE AT PGHBOXLAX!! to register your son as a goalie. Box goalie equipment - upper pads, goalie pants and leg guards - will be provided. Goalies must bring their own helmet, gloves and stick. All PGHBOXLAX league open teams are limited to 15 runners and one goalie. Families may request for their players to play on teams together and we will do our best to accommodate all teaming/carpool requests. Our goal is to field evenly-talented teams to ensure competitive play each week. Modified Box rules will apply with 6 v 6 play. No cross-checking or boarding. Games are two 22-minute running time halves. One game per team per night. Players must wear full equipment including athletic cup, mouth guard - rib pads and bicep pads are optional but encouraged. Iceoplex playing surface will be TURF for Session #2 and for all PGHBOXLAX sessions through Feb 2016. Sneakers or turf shoes - not field cleats - are recommended for the Iceoplex turf.